I haven’t baked cookies for ages. I even start to think that was around Christmas, when I baked cookies. 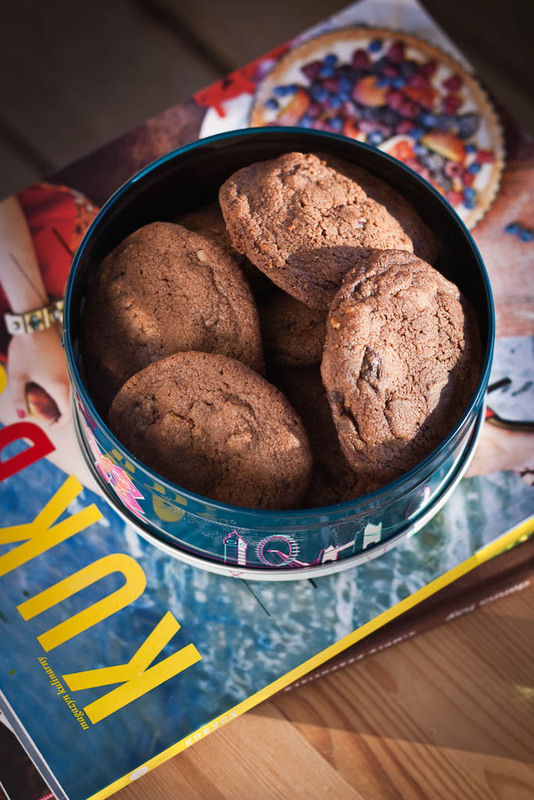 It’s good to have some cookies in a tin as a snack, it’s also kind of dangerous. A the moment of writing these words these chocolate walnut cranberry cookies exists only on the photos. It’s their own fault, they have everything you may expect from cookies a little bit chewiness, a little bit crunch, some saltiness, sweetness and tanginess as well. A lot of is going on and that’s probably you don’t even notice when they disappear. 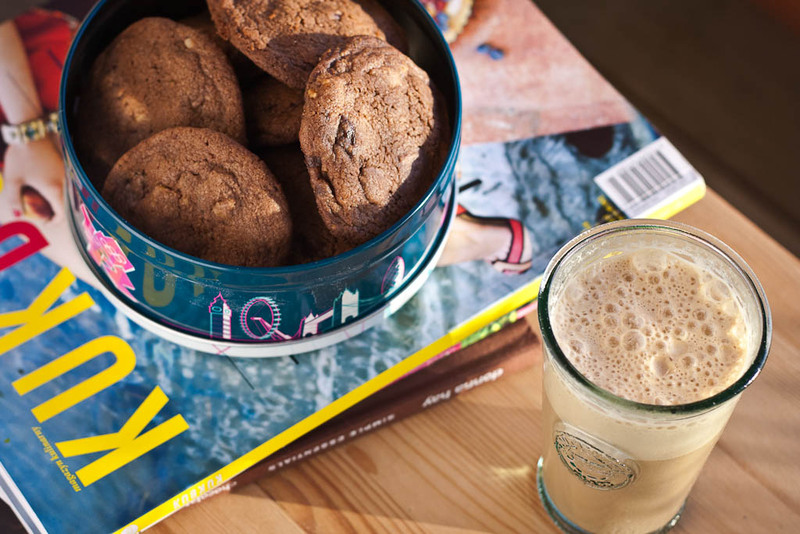 They are one of the best cookies I ever made, so enjoy them responsibly. Mix dry ingredients – cocoa, cardamon, baking soda and salt (only if you use unsalted butter). In a separate big bowl cream the butter with sugars. Add vanilla extract and egg and mix it. Add dry ingredients in 2 or 3 batches and mix until combined. Add chocolates, walnuts and cranberries and fold them in until distributed evenly. Shape dough into a big walnut size balls (you can use the ice cream scoop to do it) and place them on a parchment lined baking sheet leaving a lot of space between as they will spread. Flatten them slightly with your hand. Bake for approx. 15-18 minutes (it depends on the cookies size) or until cookies darken a bit. Transfer the cookies to a wire rack to cool. Posted in Autumn, Cookies, Winter and tagged chocolate, cranberry, walnuts. Bookmark the permalink. Nice to meet you. I’m so happy you finally decided to say hello. It’s so nice to find out there are real people reading and looking at my posts. Thank you for the compliment. These look so good. You have a great blog. Keep it up. Pretty nice post. I just stumbled upon your webnlog and wanted to say that I have really enjoyed browsing your blog posts.